It only seems like yesterday that scoreboards and journalists were calling Brendan anything other than Hosking when he had his first game in 2012 between Greater Western Sydney and West Coast Eagles. “It became a little frustrating when nobody knew my real name,” exclaimed Brendan at the time. Fifty games on and perhaps he is wishing he had remained anonymous. Goal umpire, David Dixon has moved into third place on the all time VFL-AFL games tallies for goal umpires. David now has 320 games 14 behind Craig Clark and 17 behind games leader, David Flegg. David also sits in equal third place on the list of grand finals umpired (6) with another current goal umpire, Luke Walker. 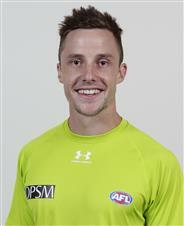 Field umpire, Shane McInerney moved ahead of Stephen McBurney into outright third place on the list of all time games umpired by a field umpire and is now only one game behind former AFL umpire’s coach and team of the century umpire, Rowan Sawers. After 8 rounds of the season gone the sea-change must have agreed with second year field umpire Andrew Stephens. Since relocating to Melbourne he has been selected in all eight rounds to date. Two of those games have been in his native Queensland the remainder spread between New Zealand, Melbourne and WA. Two SA boundary umpires who moved to Melbourne in the off season have made the most of their change of address also with both Dillon Tee and Jason Moore umpiring all eight games. Steve Baran was our Fiona McBurney Match Day Participant this week at the Melbourne v Western Bulldogs match. While proud parents, Bev and Stan along with friends and family sat in the stands, Steven went about his role as an assistant trainer with a real passion. See his day in pictures on the website later this week. Goal umpire Mark Ensby who umpires out of Tasmania had a game he will never forget this weekend, Hawthorn v Sydney at the MCG in front of 63,000 plus spectators. It was Mark’s 10th career game. He then had to double up at Etihad on Sunday as the emergency goal umpire in the Essendon v Brisbane game before heading back to Hobart. Daniel Wilson must have felt like a ruckmans jumping bag yesterday when Ace Cordy used him as a step ladder in an attempt to spoil a goal. Daniel stood his ground, Ace finished on the ground and Melbourne scored the goal. With WA boundary umpire, Jace Collingridge on the sidelines with a potentially season ending injury all of the remaining boundary umps are getting the call up each weekend. They are all relishing the fact that they can run each weekend. Both Callum Brown and Adam Bastick are really enjoying the ability to get a continuity of games to help improve their performances.